Ruthiebear (Titusville, NJ, United States) on 10 September 2017 in Animal & Insect. On the ground next to my Butterfly Bush was this swallowtail, as we were setting things up. The butterfly has had a bad luck. The shade of the picture is warm and bright. A great picture of the butterfly, the whole series has so far been interesting and just used effects to compile an image :-)))) Haleja. Happy day my good friend Ruthie. Ough !! Bad luck for the butterfly. Bonjour ma jolie Ruth! Oh, dommage qu'il ait un aile de brisé, il est si fragile et tellement beau! Bise, bon dimanche tout en douceur! Your experimental approach has result in a stunning butterfly picture. Excellent, very vivid color. The color is superb, both the butterfly and background are just right. Nice work. Stunning image in beautiful colors. Excellent treatment. Quel rendu quelles ailes et vue fantastique papillon et iamge. The butterfly seems to be part of the beautiful plant texture ... Well done ... Awesome! Hugs dear friend! Wow verh special ! Never seen this butterfly . 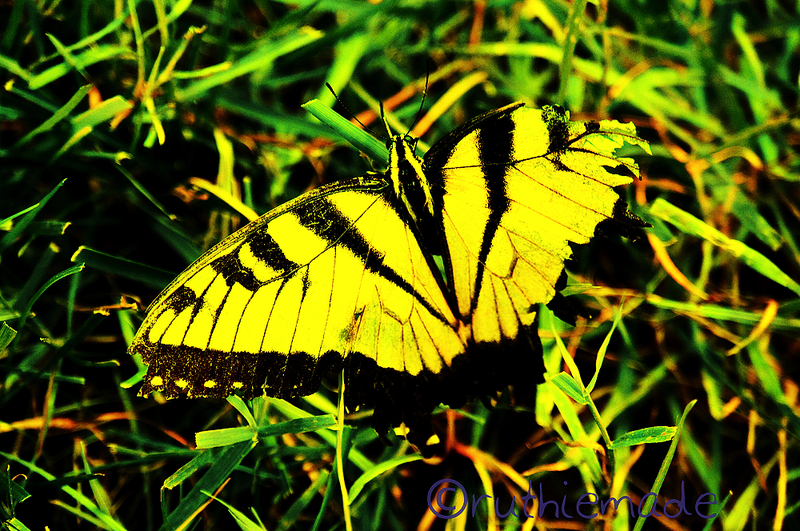 I love photographing butterflies. This nicely composed. He has gorgeous color. I find it sad at the end of the summer that the butterflies look so battered. They are such beautiful little creatures. A lovely image. Magnificent close-up of the butterfly! The battered beauty. Lovely capture of the colorful butterfly.